Hanuman is the king of the monkeys and devoted servant of Lord Rama. When his master’s wife Sita was kidnapped, it was Hanuman who led the army to recover her from the clutches of the demon Ravana. 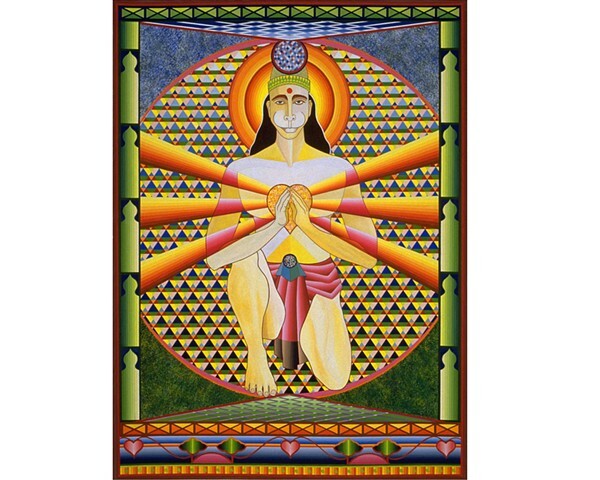 In this painting, rays of energy pour out of Hanuman’s heart, healing the world. His desire is to use his power to serve humanity. When I first practiced a yoga posture to open the heart, I felt a Hanuman-like energy radiating from the center of my being. In that moment, I knew I had to paint Hanuman to fully evoke that power.